Early this year the Remigius Kammerchor Nagold, formerly known as Kammerchor Altensteig, commissioned a piece for the Chorfest Frankfurt 2012. It was supposed to be an arrangement of the swabian folk song Mädle ruck, ruck, ruck an meine grüne Seite, in which a youth courts a girl – Girl, come, come, come by my green side. The song itself is very simply built with numerous stanzas and only little musical material. In my arrangement I keep this simple form, using Friedrich Silchers version of the song (Die Auserwählte) as a starting point. His plain setting for male choir is distributed on the two male choirs which stand at the edges of the choir. Starting of together the two male parties soon begin two brawl over the girl which undecisively see-saws between the two. When learning a new language, a whole new universe of possible texts for musical settings is revealed. 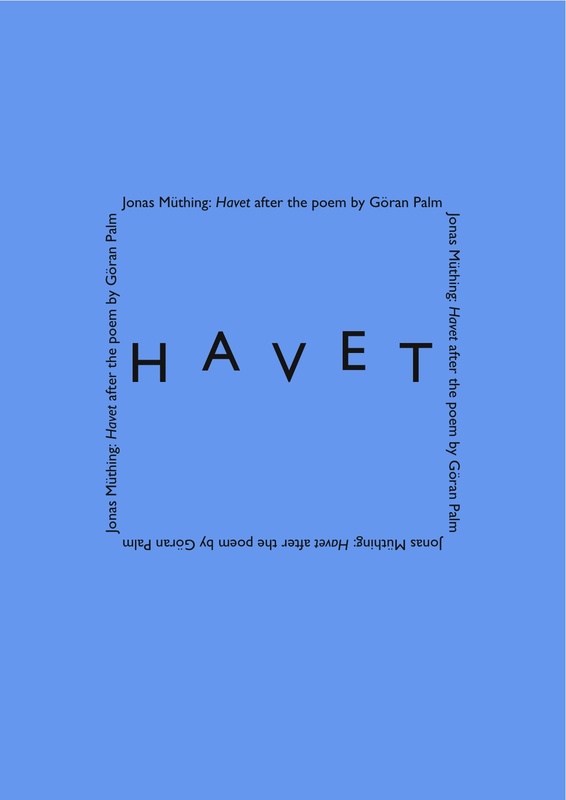 Havet is my first piece in Swedish: Its author Göran Palm’s poetry is not unlike the poetry of Robert Gernhardt, balancing between deep meaning and nonsense. I tried to find a way to translate this tightrope walk, keeping the wit of the text but also emphasising its serious side. The choir improvises with the six materials given in the score. The singers start with only the first event, during the piece the other materials are added – i.e. the new material does not replace the existing but instead the choices for improvisation are extended. Each singer improvises individually: He or she chooses an event, performs it, takes a rest of arbitrary length and begins with the next event of his or her choice. Even the first material is not meant to be performed by the whole choir or by a group of singers simultaneously. The chord is only given as possible choices of pitch. The duration spans given with the events indicate their approximate length. The soloist might be a woman or a man and should perform without amplification, if possible. The part consists of six events that begin at the times indicated on the duration axis. Each event is executed once. Together with the beginning of the soloist’s events the materials for the choir are added. Depending on the size of the choir it might be advisable to begin with only a part of the singers.